At the end of a busy and sometimes stressful week, it's nice to go into nature and enjoy all the beautiful things God has created. With warm sunshine and a full gas tank, we went on such an adventure. On country roads, through farm fields and sagebrush, we meandered leisurely through the countryside. How refreshing it was to be on highways where we were the only vehicle for miles around. Quaint and quiet towns were scattered along the way, just begging to be explored. Beautiful farm houses on dryland wheat ranches were nestled remotely in gullies and roadsides. Barns and buildings were well-kept with paint and rooftops that matched one another. After awhile sage-covered 'wasteland' surrounded us. Cattle dotted the countryside, even the rocky basalt hillsides along the way. Nothingness but nature. 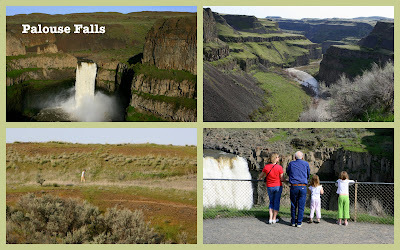 A bumpy, narrow, semi-gravel road suddenly opened up into a picnic and camping area --- all overlooking the next bluff with an amazing waterfall, cascading 198 feet into a basin below. With the winter snow-melt, it was roaring with excitement! Glacial floods formed waterfall along the Palouse River as it worked its way towards the famous Snake River. The falls plunge into a deep green pool at the base, and when sun strikes spray at the bottom of the falls, a beautiful rainbow results. Surrounding the falls are huge rock formations, dwarfed by the vastness of the plains surrounding them. Beside the falls, basalt spires create the imagine of turrets and a medieval castle for those who allow their imagination to soar. As the river continues from the basin, it cuts through a narrow gorge to the Snake River, through walls of columnar basalt that's layered with 100-foot-thick lava flows. Unimaginable beauty as only God can create!